Terrence Malick’s latest might not be his most critically praised one, but it still retains that particular magic that’s unique do Malick’s films, a contemplation of life’s choices, joys and regrets that feels fulfilled even if it ends with its narrative wide open. Portman plays Elizabeth, one of Rick’s (Christian Bale) lovers, a married woman pregnant with the failing screenwriter’s baby, one of many affairs and dalliances the protagonist goes through to find his way home, or his way forward. She doesn’t play her as an insecure mess, but as a defiant messenger bringing Rick a clearer perspective on life in a way he couldn’t achieve himself. It’s a striking if brief performance, a brilliant supporting turn that never misses the opportunity to become its own particular beast tangled in its own particular story. James McTeigue’s and the Wachowski sisters’ Alan Moore adaptation is not only probably the best movie taken from Moore’s graphic novels, but one of the smartest, most thrilling action movies in recent memory. That doesn’t mean it’s void of particularly great performances, especially with Hugo Weaving portraying freedom fighter V with such panache while he “recruits” Evey (Portman) for his cause of destroying the totalitarian government ruling the land in this dystopic future. Portman’s character goes through hell through V for Vendetta’s running time, and it’s the actress’ responsibility to take us with her, and chart this impressive character arch throughout the film. She does it with ease, building an honest and careful portrayal of a rebel in the making living in a world that isn’t particularly nice to rebellious personalities. Yes, Portman’s debut is still one of her most impressive and unforgettable performances. 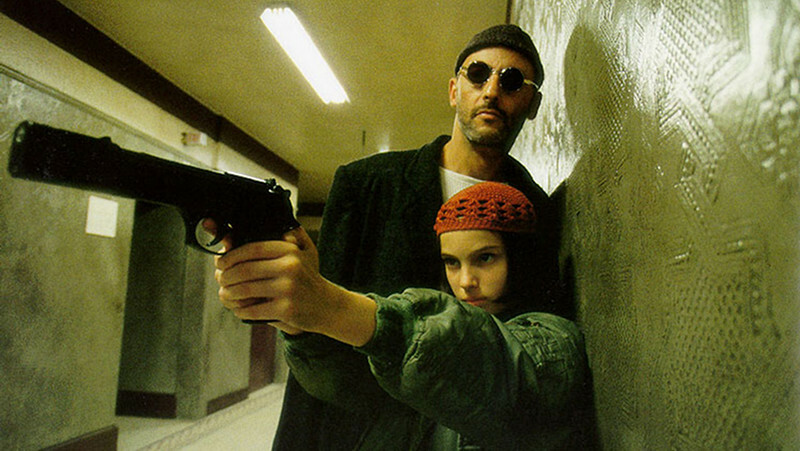 As the daughter of a drug dealer who’s just seen her father, her mother, her older sister and her younger brother getting killed by a corrupt DEA agent, Portman appears as a frail 12-year-old girl taking refuge in Léon’s (Jean Reno) apartment. Léon is a trained and tested professional hitman, and she asks him to teach her the secrets of the trade so she could take revenge for her family. As this is a Luc Besson’s movie, everything is exaggerated and strung-out, but Portman’s performance is not only striking because of that, it’s also tremendously subtle and mature in the way it builds this young girl’s world, tears it down and starts building it back up again in a twisted and violent way. Portman’s first Oscar nod came for Mike Nichols’ brilliant relationship drama, a cynical and heartrending portrayal of two couples and their lies, infidelities, obsessions and overall flawed dynamics. As the mysterious Alice, who springs up on Dan’s (Jude Law) life after he rescues her from a car crash, Portman is the wild card in a romantic quadrangle that includes the brutal masculinity of Larry (Clive Owen) and the stunted professionalism of Anna (Julia Roberts). Is a quartet of amazing performances, and yet Portman’s still stands out. The core of her work is in hiding Alice’s secrets in plain sight, in understanding the character and still maintaining a certain kind of aura around her, a sensuality that comes from her freedom from convention, a cynical core hiding behind a romantic façade that she too wishes was true. It’s perhaps the film’s most unforgettable character, and that’s certainly saying a lot. The part that finally gave her the Oscar she richly deserved throughout her career, Black Swan’s Nina Sayers is a ballerina obsessed with perfection and purity, a woman stunted by her overbearing mother and her profession’s constant request for technical excellence. When she’s selected to play the lead in her company’s adaptation of Swan Lake, she falls apart at the seams trying to deal with the pressures of the gig and the competition of a more sensual fellow ballerina, played by Mila Kunis. Portman is obviously the backbone of the film, the one character we’re nearly always seeing onscreen, and Aronofsky’s direction finds ways to frame her performance so we’re always seeing new aspects of it. Whether it is Nina looking deranged at her own image in the mirror or her body language as she’s walking down a dark alley, there’s something very complete and vibrant about Portman’s performance here that definitely qualifies it as her best work to date.